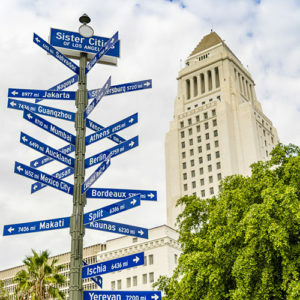 A signpost with all the Sister Cities of Los Angeles labeled. City Hall in the background. In the City Diplomacy online forum, moderators Fleur Johns, Karen Knop, and Annelise Riles invited members to reflect on the increasing boldness and visibility of cities’ diplomatic engagements. Among the questions posed in their introduction were whether city diplomacy is really a growing phenomenon, what versions of international relations it might produce, what it might achieve that seems difficult to achieve otherwise, what the implications might be for rural and remote communities, and what the risks for cities themselves might be of the resulting global connection and disconnection. Who is the city in city diplomacy? One theme of our discussion has been the importance of not treating the city as a smaller version of the abstract state and of not attributing singular public agency to it (Mariana Valverde, Neema Kudva). Large v small cities – Whereas the writing on “global cities” tends to focus on private actors and global economic networks that cluster in major cities, interest in “city diplomacy” tends to organize around the city itself as a public actor that is developing a global reach (Janne Nijman, link in post to her “Renaissance of the City as a Global Actor”). Although it is not only global cities that engage in city diplomacy, theories tend to be built around large cities like London, New York, and Paris together with large cities of the global South in a post-colonial period (Neema). The most highly networked US cities, for instance, are primarily the biggest, and they are also the cities with the resources to pursue diplomacy as a strategic exercise and to drive the global urban diplomacy agenda (Kris Hartley, link in post to Chicago Council on Global Affairs (CCGA) report; Boston University Initiative on Cities (BUIC) report linked in post by Vanessa Vardon). A city-oriented or city-originated version of international relations would therefore tend to reflect patterns of power or of knowledge dissemination from “core” wealthy countries to the global development “periphery,” even though a more progressive urban agenda might result on issues like climate change (Kris). But not all of the most highly networked US cities are large. “Big tent” networks bring together broad coalitions of diverse cities of all sizes (eg, Global Covenant of Mayors), while “high hurdle” networks are more selective and tailored to the most aggressive cities on policy innovation (eg, C40, 100 Resilient Cities) (Vanessa, BUIC report). Older forms of city diplomacy such as city twinning and city-to-city bilateral relations include smaller cities, can be more particularized and may therefore be worth fresh attention (eg, collaboration of Rochester, NY and Nagasaki, Japan to address the legacy of war) (CCGA report, Annelise Riles, Karen Knop). Practical diplomacy – The notion of city diplomacy has changed the international law focus from formal legal arrangements between states to include informal cooperation between cities (Helmut Aust), however, an equally important shift is to the cumulative significance of changes in the mundane practices of many actors moving between cities (Fleur Johns). Between border cities, there may be little diplomacy involving the two city councils, but instead, large-scale practical diplomacy that enmeshes individuals, NGOs, broader public sector entities like universities and forms of authority ranging from a jointly owned tunnel to ad hoc cooperation over sports events (Chris Waters). Practical diplomacy goes even farther for small cities in the Global South, where regional networks accomplish such everyday purposes as getting an education, processing waste and providing water provision, unlike in large cities, in which city apparatus already encompass most networks of everyday life (Neema). City diplomacy in such small cities is essential, in comparison to cities of the Global North where it often raises challenges in closing the democratic gap between investment in international diplomacy and community concerns on the ground (Jenna Condie, Kris). The “city” – As to the “city” in “city diplomacy,” we should not assume that it is simply the existing city government or its political body. In the case of Google’s Sidewalk Lab’s project to develop the Toronto waterfront, its city partner is actually a specially created legal authority funded by three levels of government (Mariana). Such special purpose authorities, which can themselves be public-private partnerships, are less transparent and accountable than a city council would be. In high-density cities, the law of private property means that vast amounts of space are regulated in even less accountable ways by condominium rules, building management statements and other documents drafted by private developers and alterable by subsequent property owners. It might be possible, for example, to largely ban Airbnb from a city if all condominium rules did so (Cathy Sherry). As these examples illustrate, thinking about city diplomacy also needs to attend to the “smart city” movement and the city as a technological site (Chris Pettit), including for direct democratic engagement (Bronwen Morgan raises the possibilities of collaborative economy initiatives based on digital platforms). City against state? Much of the positive press that city diplomacy has recently received comes from the potential of cities and issue-specific city networks to resist problematic state policies and to compensate for the failure of state-to-state diplomacy to address pressing problems (Janne). For example, the provision of shelter to undocumented migrants by some Dutch cities has opened up a strong fault line between these cities and their national government, with Germany, Italy, and Spain providing other examples of cities invoking and developing international human rights law against national policy (Barbara Oomen). Recognizing the leadership potential of cities on particular issues, international and regional organizations are increasingly dealing directly with cities (Helmut, Jonas Grimheden). For instance, the EU Agency for Fundamental Rights brought together human rights cities from Latin America, China, and the United States as well as Europe. While US mayors who have joined domestic and/or international environmental networks report considerably higher level of political agency to counteract federal climate policies relative to mayors who are non-joiners, this empowerment does not appear to extend to policy issues like immigration and policing (BUIC report). In addition, in a study of 27 diverse global cities, over half reported that participation in city networks had led to change in a local policy, greater capacity of city staff and the introduction of pilot projects based on other cities’ experience. But almost none reported that its networks changed national, regional or supranational policies (CCGA report). Temporary or permanent, room to experiment? The examples of cities resisting or compensating for problems in state or inter-state governance emphasize the positive trend of city diplomacy. In contrast, some members underlined that cities remain subject to the state’s power to control their activities (Helmut, Neema), while the argument was also made that, in many settings, a state’s national interests would soon actually come to be defined by its urban interests (Janne). Others contrasted the positive instances of city diplomacy with the problem of opacity and lack of public accountability in cases such as Sidewalk Labs. A number of members emphasized the informality, flexibility and experimental quality of city diplomacy, as compared to other modes of diplomatic engagement, with different views on what regulatory conditions that suggested (Mariana, Helmut, Fleur). 이번 도시 외교 온라인 포럼에서는Fleur Johns, Karen Knop 와 Annelise Rile 교수가 사회자로서 점점 더 뚜렷해지고 강화되고 있는 도시들의 외교 업무들에 관한 논의를 나누고자 회원들을 초대하였습니다. 사회자들은 도시 외교가 과연 성장하고 있는 현상인지, 이는 어떠한 국제 관계 형태를 만들어 낼 것인지, 다른 외교 정책들로는 성취하기 어려운 성과들을 이루어낼 수 있을 것인지, 지방과 원거리 지역 단체에 어떠한 영향을 끼칠 것인지, 그리고 이로 인해 국제 관계로부터의 단절될 경우 도시들에 어떠한 위험 요소들이 있을 지 등의 논제를 다루었습니다. 이번 논의의 주된 테마 중 하나는 도시를 추상적인 국가의 작은 형태 혹은 단일의 공공기관으로 다루지 않는 것의 중요성이었습니다 (Mariana Valverde, Neema Kudva). 대도시 v 소도시 – “국제 도시”에 관한 논의가 민간 단체들과 주요도시에 형성되는 경제 네트워크에 주안점을 두는 반면, “도시 외교”에 관한 논의는 도시 자체를 국제 관계를 형성하는 공적 행위자로 다루게 됩니다 (Janne Nijman, link in post to her “Renaissance of the City as a Global Actor”). 물론 국제 도시들만이 도시 외교에 참여하는 것은 아니지만, 이론들은 런던, 뉴욕, 그리고 파리와 같은 대도시들과 함께 식민지 시대 이후 제3세계의 대도시들을 바탕으로 형성되고는 합니다 (Neema). 예를 들어, 네트워킹을 활발히 하고 있는 미국 도시들은, 대도시일 뿐만 아니라 전략적 외교를 추구할 수 있고 국제 도시 외교 안건들을 다룰 수 있는 자원들을 가지고 있습니다 (Kris Hartley, link in post to Chicago Council on Global Affairs (CCGA) report; Boston University Initiative on Cities (BUIC) report linked in post by Vanessa Vardon). 그러므로 도시 지향적이거나 도시 위주의 국제 관계들은 보다 진보적인 도시 안건인 기후 변화와 같은 이슈들을 다루기보다는, 국력이나 “핵심” 부유 국가들로부터 “주변” 국제 개발에 정보를 보급하는 형태들을 반영하게 됩니다. 그러나 네트워킹을 활발히 하고있는 모든 미국 도시들이 대도시인 것은 아닙니다. “빅텐트 (big tent)” 네트워크가 다양한 크기들의 도시들의 폭넓게 연합하는 반면 (예, 국제 시장 서약), “빅허들 (big hurdle)” 네트워크는 보다 선별적이며 정책 혁명에 가장 적극적인 도시들에 맞추어져 있습니다 (예, C40, 100 회복력있는 도시들) (Vanessa, BUIC report). 작은 도시들을 포함했던 쌍둥이 도시나 도시간 쌍무 관계와 같은 도시 외교의 옛 형태는, 이전보다 구체화되었기에 보다 주목할 만한 가치가 있습니다 (예, Rochester, NY 과 Nagasaki, Japan의 전쟁의 유산을 논의하기 위한 협력) (CCGA report, Annelise Riles, Karen Knop). 실용외교 – 도시 외교의 개념은 국제법의 중심을 국가 간 법적인 관계 형태에서 비공식적인 도시간 협력과 (Helmut Aust), 도시 간을 이동하는 수많은 단체들의 누적되는 행위의 중요성을 중시하게끔 변화시켰습니다 (Fleur Johns). 국가 간 경계의 사이에서, 두 도시의 의회를 포함하는 외교 대신에 민간인들, NGO, 대학과 같은 중요 공적 단위, 그리고 스포츠 이벤트와 관련하여 협력하거나 즉흥적으로 형성된 권력 형태들이 얽혀 있는 대규모의 실용 외교가 주를 이루게 됩니다 (Chris Waters). 실용 외교는 도시 기관이 이미 일상 생활의 모든 네트워크를 수반하고 있는 대도시와 달리, 교육의 기회 확대, 쓰레기 처리와 수도 공급 등과 같은 일상 생활의 문제점들을 해결하기 위한 지역 네트워크가 형성되어 있는 제3세계들의 소도시들에게까지 영향을 미칩니다 (Neema). 국제 외교에의 투자와 현지 지자체의 우려 사이에서 격차를 해소하는 데 문제점을 제기하는 선진국들의 도시와 달리, 제3세계의 소도시들에서 도시 외교는 핵심적인 역할을 합니다 (Jenna Condie, Kris). “도시” – “도시 외교”에서의 “도시”에 관하여, 우리는 도시가 단순히 존재하는 도시 정부이거나 정치적 집합체라고 가정해서는 안 됩니다. 토론토 해안가를 발전시키기 위한 구글의 보행자 도로 실험 프로젝트에서, 파트너 도시는 정부 기관의 세 부서가 지원하여 특별히 형성된 법적 개체였습니다 (Mariana). 이처럼 특별한 목적을 수행하기 위한 개체들은, 그 자체로 공공기관과 민간기관사이의 파트너쉽을 형성하며, 시 의회보다는 불투명하고 책임감 또한 적습니다. 특히 고밀도의 도시들에서는, 사유재산 법이란 거대한 공간이 아파트 규율, 개인 사업자에 의해 작성되고 이후 부동산 소유자가 변경할 수 있는 건물 관리 기록 그리고 기타 서류 등 보다 더 책임감이 덜한 방식으로 규율 되는 것을 의미합니다. 이에 따르면, 예를 들어, 모든 아파트 규율들이 명시하기만 한다면 도시에서 에어비엔비를 금지하는 것 또한 가능하게 할 수 있습니다 (Cathy Sherry). 이러한 예시들이 보여주듯이, 도시 외교에 대한 이해는 “스마트 도시” 움직임을 주목하는 것과 도시를 직접 민주주의 움직임을 포함한 (Bronwen Morgan은 디지털 플랫폼을 바탕으로 한 협력 경제의 가능성을 제기합니다) 혁신 기술 공간으로 바라보는 것을 통해 보다 심화될 수 있습니다 (Chris Pettit). 왜 “도시 외교” 이여야 하는가? 도시 v 국가 – 언론에서 주목한 도시 외교의 긍정적인 측면은 도시들과 특정 주제에 관한 도시 네트워크가 국가 정책의 문제점에 저항하고 특정 문제들을 다루지 못한 국가간 외교의 실패를 상쇄할 수 있다는 측면에서 기인합니다 (Janne). 예를 들어, 무허가 이주민들을 위한 몇몇 독일 도시들의 보호소 조항은 독일, 이탈리아, 그리고 스페인과 더불어 도시들이 국가 정책에 반대하며 국제인권법 발전을 위해 주도적으로 기여하는 형태를 보이는데, 이는 국가와 도시들의 의견이 첨예하게 대립할 수 있다는 점을 보여줍니다 (Barbara Oomen). 특정 주제에 관하여 도시의 선구적 역할을 인지하며, 국제 및 지역 기관들은 점점 더 도시와 직접적으로 연락을 취하게 됩니다 (Helmut Jonas Grimheden). 예를 들어, 기본권을 위한 유럽연합 기관은 유럽 뿐만 아니라 라틴 아메리카, 중국, 그리고 미국 내의 인권 도시들을 소집하였습니다. 물론 국내 혹은 국제 환경네트워크에 참여한 미국 시장들이 네트워크에 참여하지 않은 시장들에 비해 연방 기후정책들을 상쇄하기 위해 보다 많은 정치적 행태를 취하기는 하지만, 이러한 참여는 이민정책과 보안정책에서는 나타나지 않습니다 (BUIC 보고서). 또한, 27개의 다양한 국제 도시들의 연구에서, 절반 이상의 도시들이 도시 네트워크에의 참여가 지역 정책 변화, 도시 직원들의 역량 강화, 그리고 다른 도시들의 사례들을 바탕으로 한 시범 사업들의 소개로 이어졌다고 밝혔습니다. 그러나 도시 네트워크에의 참여가 국가, 지역 혹은 초국가적 정책의 변화로 이어졌다고 하는 도시들은 거의 없었습니다 (CCGA report). 일시적인가 지속적인가, 아직 시험 중인가? – 국가 내 혹은 국가 간의 문제점들을 상쇄하고자 하는 도시들은 도시 외교의 긍정적인 측면을 강조합니다. 이와 대조적으로, 몇몇 회원들은 국가의 이해관계가 도시의 이해관계에 의해 정의된다고 말하며 (Janne), 도시들은 여전히 국가의 통치 하에 있다는 것을 강조하였습니다 (Helmut, Neema). 다른 회원들은 도시 외교의 긍정적 사례들을 보행자 도로 실험 사례에서의 불투명성과 공적 책임의 부재와 같은 문제점들과 대조시키기도 하였습니다. 몇몇 회원들은 도시 외교의 통제 조건들에 대한 견해들은 달리하였지만, 공통적으로 도시 외교가 다른 외교 형태에 비해 비공식적이고 융통성 있으며 실험적인 성격을 띈다는 것에 의견을 같이하였습니다 (Mariana, Helmut, Fleur).